In today’s society, installing drywall is a common and cost-effective practice. Homes and businesses all across the country rely on the advantages provided by their chosen drywall company. Even DIYers have found success as amateur drywall finishers, creating results to be proud of. While we all know the value behind drywall installation services, few people know the history surrounding gypsum board products. As your trusted commercial drywall company in Illinois, AZ Drywall Finishing is here to be your full-service provider of metal stud framing, drywall hanging, and finishing. Our drywall contractors in Chicago are dedicated to providing full-service results for projects of all sizes. We’re passionate about industrial drywall, and our team is always happy to educate others. Today, we’ll highlight the history of wallboard and how it has helped to shape our modern society. If you are looking for a local drywall company to create quality outcomes for your upgrade, addition, or new structure, be sure to call us for an estimate! In the early 1900s, gypsum and plaster were widely used for housing, making it a smart choice for the United States Gypsum Corporation to incorporate dozens of companies with the purpose of creating and improving drywall. This gypsum board was created in 1916, but the initial reviews were not good. This drywall company took it on themselves to market their product as the “poor man’s solution” for those not able to afford plaster walls. This unique blend boasted that it was “fireproof,” a claim which would not be stated today, yet the product was naturally resistant to fire nonetheless. Drywall was thought to be a smart product a century ago because its construction was simple and effective, saving in time and labor costs. Unlike plaster options, drywall is ready to finish in hours, not days. Moisture conditions can heavily affect plaster installation! Wallboard was marketed to go up in all types of weather, creating a truly convenient solution for the average American. Unfortunately, the small amount of success garnered by the poor-man campaign had a counterproductive outcome: drywall was seen as a cheap and temporary answer. Experience and expectation proved that plaster was the reliable method for creating beautiful interiors, and wallboard was an untested fad. These new conveniences were not worth changing the entire construction industry! 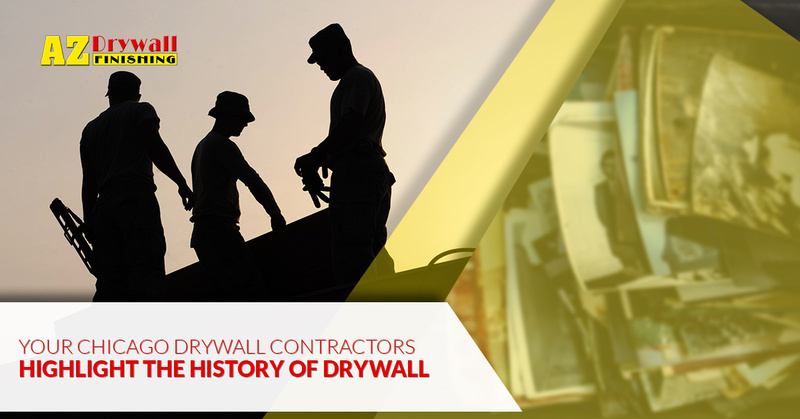 For decades, drywall worked to gain a foothold as a cost-effective solution for home renovations and construction. Up until the 1940s, Americans were perfectly happy living with the old ways of home design. Following World War II, Americans were ready for the future as a victorious superpower, relying on a now-bolstered work force and optimal production resources. After the terror of war and the struggles during the Great Depression, families now wanted to live the American Dream. This included the white picket fence, the perfect lawn, tidy kitchens, and so on. Everyone was looking to make their home neat and clean, creating that perfect family life. Drywall fit the bill perfectly for these needs, providing exacting fits and minimal joints to help create a tidy home life. There was one other reason why drywall installation became a top choice in the 40s and 50s. In the 15 years following the war, over 20 million homes were built across the country to make room for the booming population. The logistical demands of producing and installing such a heavy workload made drywall the best candidate, delivering efficiency on many levels to deliver an outstanding outcome for businesses and homes across the country. Over the decades, wallboard has evolved to become more durable and cost-effective than ever. Unlike the original products, modern drywall is now safer and more eco-friendly than ever. Your commercial drywall company will likely have a recycling plan in place to reduce our impact on the environment. Homeowners and drywall contractors alike can benefit from the simple, precise, reliable characteristics of today’s drywall. If you’re in need of a team to provide comprehensive services to get your project done on time and on budget, AZ Drywall Finishing is here to help. Since 1999, our experienced drywall contractors in Chicago have worked to create top-notch outcomes for Illinois businesses. Contact our commercial drywall team today to learn more and to get your free estimate!